What is the purpose NSF I-Corps? The National Science Foundation’s Innovation Corps (I-Corps™) is a federally funded program to help prepare scientists and engineers to extend their focus beyond the university laboratory, and accelerates the economic and societal benefits of basic-research projects that are ready to move toward commercialization. 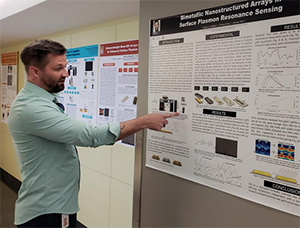 Through I-Corps, NSF grantees learn to identify valuable product opportunities that can emerge from academic research, and gain skills in entrepreneurship through training in customer discovery and guidance from established entrepreneurs. How is NSF I-Corps structured? The program connects academic researchers with the technological, entrepreneurial, and business communities through the work of I-Corps Teams, I-Corps Sites and I-Corps Nodes, which combined make up the National Innovation Network. I-Corps Nodes are designed to support regional education, infrastructure and research around innovation. The Nodes deliver an innovation-enhancing training program based on the curriculum used to support NSF I-Corps Teams. They develop near-term tools and resources that will impact and expand the benefits of the entire I-Corps program across the Nation. They also identify and pursue longer-term research and development projects that advance the goals of the I-Corps program. The I-Corps Nodes work together and with I-Corps™ Sites to build, draw upon and sustain a national innovation ecosystem that further enhances the creation of technologies that benefit society. What is the base methodology of I-Corps? I-Corps is based on the Lean Launchpad (LLP) Methodology, which is basically the scientific method for identifying a business opportunity for a product, service or innovation. LLP enables the systematic identification of knowledge gaps in order to understand the most appropriate path forward for their concept. Built around the concept of Customer Discovery, LLP helps match the value proposition of a product, service or innovation with a customer segment that pay for the value being provided. How are UNCG & NCAT Involved in I-Corps? In 2016, a team from UNCG’s JSNN successfully completed a National Level NSF I-Corps program. Thereafter, it was decided that the Greensboro region could benefit from the LLP methodology and NSF I-Corps program to enable university innovators, nurture the local innovation ecosystem, and contribute to the grander national innovation ecosystem. In February 2017, in collaboration with NCAT, UNCG’s Office of Research & Engagement submitted an application to become an NSF I-Corps Site. Through a competitive evaluation process, in August 2017, UNCG + NCAT were awarded a 5-year, $500,000 grant to become established as an I-Corps Site. Along with UNCG + NCAT, *** were also selected in 2017, joining UNCC as the only other NSF I-Corps affiliated programs in NC. What is the structure of UNCG + NCAT’s I-Corps Program? The UNCG + NCAT I-Corps Program will feature the LLP Short-Course, encompassing multiple 4-5 week cohorts throughout the year, with a goal of training 30 teams each year on the LLP Methodology. Teams consist of at least a student Entrepreneur Lead (EL), faculty Primary Investigator (PI) and Mentor. These teams will be in cohorts of 5-10 teams, receiving “mini-grants” up to $10,000 to fund their customer discovery process, prototyping, and other seed expenses the team. Teams will be expected to complete 20-30 customer discovery interviews throughout the cohort timeline, with a goal of developing a clear direction in which to take their innovation upon completion. Who is eligible for the UNCG + NCAT’s I-Corps Program? The UNCG + NCAT I-Corps Program is open to current UNCG and NCAT Undergraduate and Graduate students, Faculty, Staff and recent alumni. Ideally, teams will be complete with at least 3 members – student Entrepreneur Lead (EL), faculty Primary Investigator (PI) and Mentor. If individuals are unable to form a complete team, they are still encouraged to apply as we will be able to assist in developing a completed team. What are the benefits of I-Corps? 1613D MHRA Bldg, 1111 Spring Garden St.
What is the difference between NSF I-Corps and UNCG-NC A&T I-Corps program? The NSF (National Science Foundation) I-Corps is a national program. It provides funding which is disbursed to institutions to promote science and innovation. 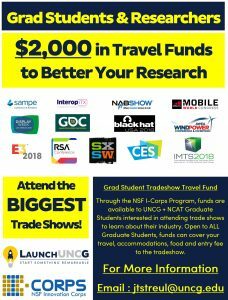 The UNCG-A&T I-Corps program is a part of the NSF's Innovation Corps intiative, which is a regional program to benefit Greensboro and the Triad by spurring innovation and entrepreneurship. What will this program look like? There will be five cohorts of students and faculty, the first of which begins in Octoboer. Each cohort will last 5 weeks, during which each team (generally 3 UNCG-A&T students and/or faculy members) will have to meet at least 30 potential buyers of the product or servce that your team will develop. Funding will be granted to help defray cost associated with these meetings, such as travel and lodging expenses. Upon successful completion of the program, we sincerely encourage our I-Corps graduates to apply for the national program once they meet the minimum requirements. I have a great idea, but how will this program help me implement it? This program will provide structured mentorship and funding to further your team's business or research ideas. In addition to the funding that each team is granted, each of the 30 meetings that your team holds throughout the program will yield invaluable information. The mentorship component is provided every Friday during the program, when each of the teams meet at HQ Greensboro and discuss the successes and meetings each respective group has had and held. Is the entire team required to participate in the seminars, workshops, and on-site assignments? Although confidentiality is a requirement of the program, we highly recommend you consult with UNCG's North Carolina Entrepreneurship Center (NCEC) or the Innovation Partnetship Services Office (IPSO) to discuss any concerns you may have prior to applying. Both are located on the first floor of the MHRA building on UNCG's campus. Will my idea qualify for this program? Can you help me find a team or a mentor? Yes, contact the NCEC today! For Cohort 1, the Kickoff Workshop will be held Friday, October 13th, from 3:00 to 6:00pm at HQ Greensboro. The intermediate meetings will be held every Friday, at the same time and location. The Closing Workshop will be held Friday, November 17th. As a prerequisite for participating in the I-Corps program, all team members are required to watch a set of videos that are integrated into the Friday classroom sessions. All videos feature Steve Blank, a legendary startup leader who developed the "Lean Launchpad Methodology," serving as the basis of the I-Corps Program.